08/02/2017: 4 babies, day 23 of the gestation period. Cat is a super girl - extremely gentle and kind, easy-going and relaxed - she is one of the steadiest rats I've ever had, doesn't overreact to anything and is a completely pleasant and fun girl to have in a group. 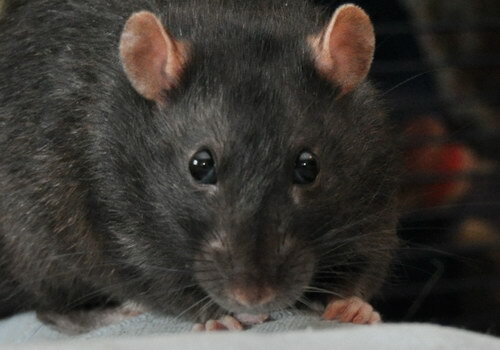 She submits easily and enjoys playing with younger rats, including getting tumbled by them. She is a fairly large doe with lovely type which has earned her a couple of NFRS variety stars. This is her second litter and as her first threw quite a mixed bag we wanted to try an inbreed to maximise on her good traits. Batman is one of my favourite bucks ever; absolutely bombproof, extremely licky and friendly, and a great natural alpha. He is a NERS stud champion and has fantastic type, beautiful eyes, and has kept his black colour very well. This is an inbreed on the Eltons, who were quite an unrelated litter that very much worked, so I want to try and fix all the great things that we got out, particulary type and temperament. I'm hoping for robust people-loving kittens who are balanced and confident, engaging yet independent. I'm expecting black and russian blue in Essex and unmarked, with a smaller chance of mink, dove and dumbo. I plan to keep two does from this combination. If you are interested in going on the list for future litters, please see the Homing page for more information. 2018 note: This litter caught parvo virus during gestation, which we didn't realise until subsequent failed litters pointed towards an active parvo infection. As a result of the virus, both Prawn and Ark developed congenital problems from around 9-11 weeks of age (parvo viruses require actively dividing cells to replicate so it's no surprise that this happened during their rapid growth period). Prawn was very sadly put to sleep at only 4 months old with a serious heart defect, and her sister Ark suffered violent seizures which were well controlled with medication for some time, but when the fits returned she was also put to sleep, at only 10 months. I miss these two girls more than words can say - they were so gentle and beautiful, inside and out, and it feels very unfair that their lives were so short and that we couldn't do anything for them. Goodnight my loves, I'm so so sorry.